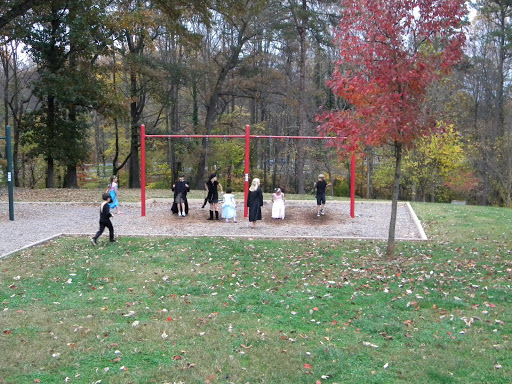 A few years ago, a neighborhood friend called me and asked if I would help her revive an old tradition of a potluck gathering at the park on Halloween before trick or treating. It started out as something the kids could do between school and trick or treat time, let them see each other’s costumes and maybe get something besides sugar into them. As her kids got older, I seemed to take over. Which really isn’t that much of a stretch really, seeing how I live across the street from the park and use any excuse to throw a party, anywhere. Over the years, as one group of kids grew up and over the party at the park, a new group of kids have arrived. This year’s party had a small handful of the old guard there, but a slew of new little kids that had moved into the neighborhood. From a neighbor, I had been handed contact information for someone that wanted to help with the party this year, someone who is ready and willing to take over the party when I’m ready to hand it off. It’s definitely sort of bittersweet to watch it transition. We still have a few years left and I know Edie takes great pleasure in the fact that HER mom is in charge of the party at the park every year, but there is really something sweet about seeing the new little ones and watching their parents form bonds. Some of my best friends are the other mothers in this neighborhood, and our entire relationship is based on taking our kids to that park every afternoon. I love finding out a new family is there because they saw my flier hanging up somewhere in the neighborhood. How flipping cool is that? Alot of the parents didn’t show up in costume and when they saw me in my fabulous witch hat, a few made comments about ‘Oh, I didn’t know that was part of the tradition’. That’s the thing about traditions, we can hand them down, but they are yours to do with what you want. Sure, I’d love to see someone else drag out their grandmother’s punch bowl and use it at that thing every year (although I’m pretty sure I’d be willing to continue doing that one myself for quite some time), but it’s not mandatory. Neither are adult costumes. Or as many kinds of mac & cheese as you can imagine. Has anyone else noticed that mac & cheese seems to be the universal kid favorite pot luck dish? Although it was good to see the tray of hot dogs being served up. I may have a reputation of being a serious foodie, of demanding to know where most of my food comes from, but, I do break that for a hot dog. So contradictory, I know. Well, I am nothing but a walking contradiction. After getting some food in the kids and the sun starts going down, we all head out to hit the trick or treat trail. After countless years with her friend Nick, Edie ended the night with a pack of her neighborhood girl friends instead. She’s still not sure how she feels about that change -she’s pretty sure she would have ended up with more candy had she been with Nick, but she still has more than she’ll ever eat. She’s already lost interest in it….and hasn’t noticed that we’ve eaten all the butterfingers already….although she finally found someone to trade that bag of pretzels to. So maybe mixing things up is good, yes? I’m still dressing a witch next year though. That’s one tradition I like not having to put too much thought into every year. I'm jealous….and very happy for you. It all sounds lovely and I'm sure you have more than a few good years of park party'n in you!